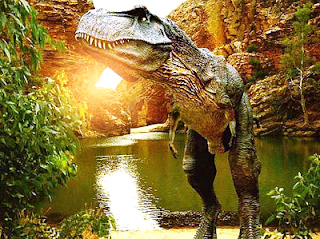 HomeDoc En environment in English SCIENCE Video documentaries Wildlife What Really Killed The Dinosaurs ? Until recently most scientists thought they knew what killed off the dinosaurs. A 10km-wide meteorite had smashed into the Yucatan peninsula in Mexico, causing worldwide forest fires, tsunamis several kilometres high, and an 'impact winter' - in which dust blocked out the sun for months or years. It was thought that the dinosaurs were blasted, roasted and frozen to death, in that order. But now a small but vociferous group of scientists believes there is increasing evidence that this 'impact' theory could be wrong. That suggestion has generated one of the bitterest scientific rows of recent times. The impact theory: The impact theory was beautifully simple and appealing. Much of its evidence was drawn from a thin layer of rock known as the 'KT boundary'. This layer is 65 million years old (which is around the time when the dinosaurs disappeared) and is found around the world exposed in cliffs and mines. For supporters of the impact theory, the KT boundary layers contained two crucial clues. In 1979 scientists discovered that there were high concentrations of a rare element called iridium, which they thought could only have come from an asteroid. Right underneath the iridium was a layer of 'spherules', tiny balls of rock which seemed to have been condensed from rock which had been vaporized by a massive impact. On the basis of the spherules and a range of other evidence, Dr Alan Hildebrand of the University of Calgary deduced that the impact must have happened in the Yucatan peninsula, at the site of a crater known as Chicxulub. Chemical analysis later confirmed that the spherules had indeed come from rocks within the crater. Challenging the theory: A group of scientists led by Prof Gerta Keller of Princeton and Prof Wolfgang Stinnesbeck of the University of Karlsruhe begged to differ. They uncovered a series of geological clues which suggests the truth may be far more complicated. In short, that the crater in the Yucatan is too old to have killed off the dinosaurs. They concentrated on a series of rock formations in Mexico where the iridium layer was separated from the spherule layer by many metres of sandstone. That opinion sparked a massive row, as the supporters of the impact theory such as Prof Jan Smit of Vrije Universiteit, Amsterdam, rubbished Keller's ideas. Smit argued that the sandstone had been deposited by massive tsunami waves caused by the asteroid, and so did not undermine the idea of a single impact. But Keller's team found evidence - such as ancient worm burrows - that suggested that the deposition of the sandstone had been interrupted many times. They concluded that there was a gap of some 300,000 years between the deposition of the spherules (from the Chicxulub crater) and the iridium (from an asteroid). Therefore there must have been two impacts.